My poor old fig tree - things just go from bad to worse with every month that passes. In early June, when I last posted about it, it was just recovering from the massacre that I called 'pruning' ! After that shock it managed to rally, and had begun to put on lots of growth and new foliage. I was beginning to feel a little better about it, as it seemed to have recovered so well. Then ... the roofer arrived ! pantiles were past their best! They leaked in many places and had slipped and broken in some cases. Goodness knows when they were last replaced. So, the work had to be done and the roofer duly arrived to strip the old pantiles off and replace with new. 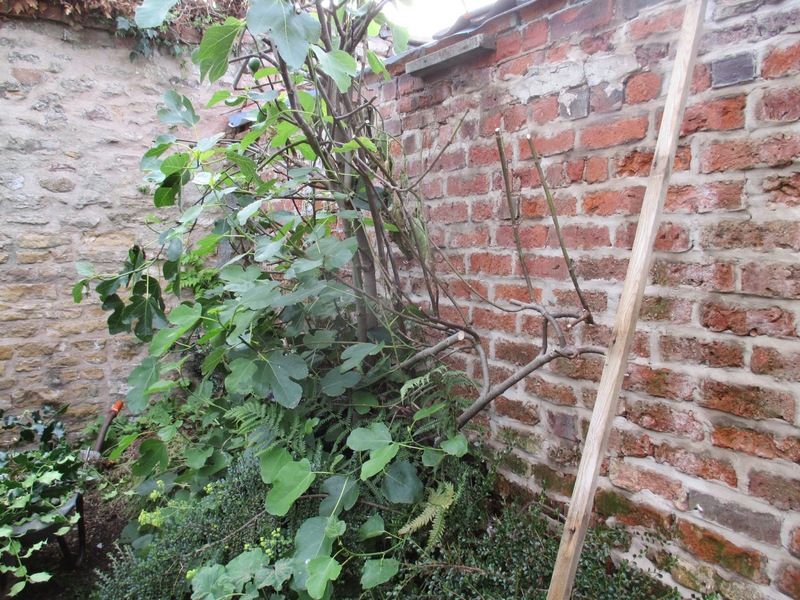 I had my fingers crossed, hoping he could work around my poor fig tree, but he couldn't even make a start until it was pruned back severely (AGAIN!) to allow him access ! I could see what he meant, as he couldn't even get to the roof until the tree had been considerably reduced in size. 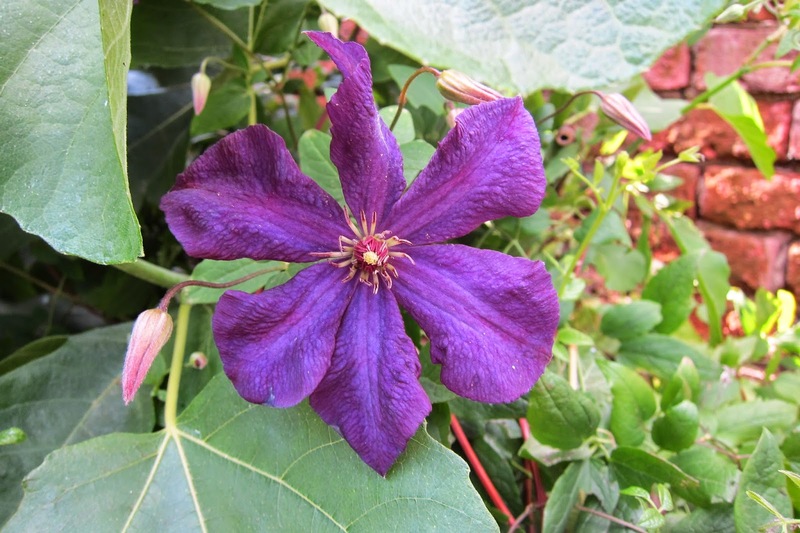 The 'Polish Spirit' clematis was in full, gorgeous flower, but it had to be chopped right back too. It was with a heavy heart that I wielded my secateurs and loppers. Once the cutting back was finished, the poor tree looked brutalised. 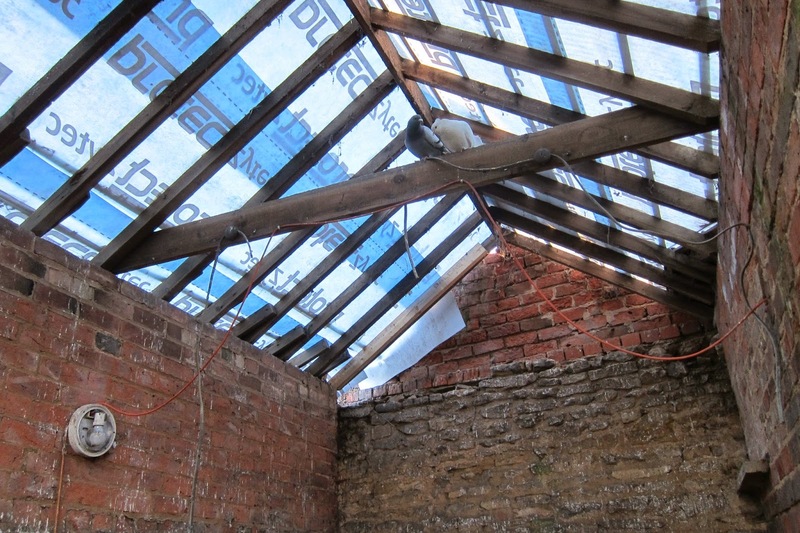 So, now the roof is finished, and it is all watertight and ready for the next forty years ! 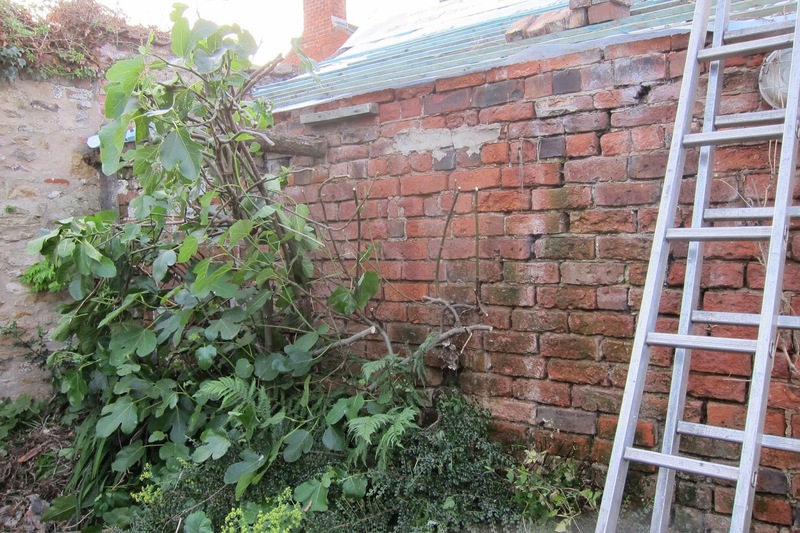 I hope the fig tree will cope yet again with the shock of hard pruning, especially mid season. This post is linked to the monthly meme, 'Tree Following, hosted by Lucy at 'Loose and Leafy'. There are some cracking blogs over there ! I feel your pain. I hope all will be well. And you've got a new roof! Thanks Cynthia, it had to be done ! 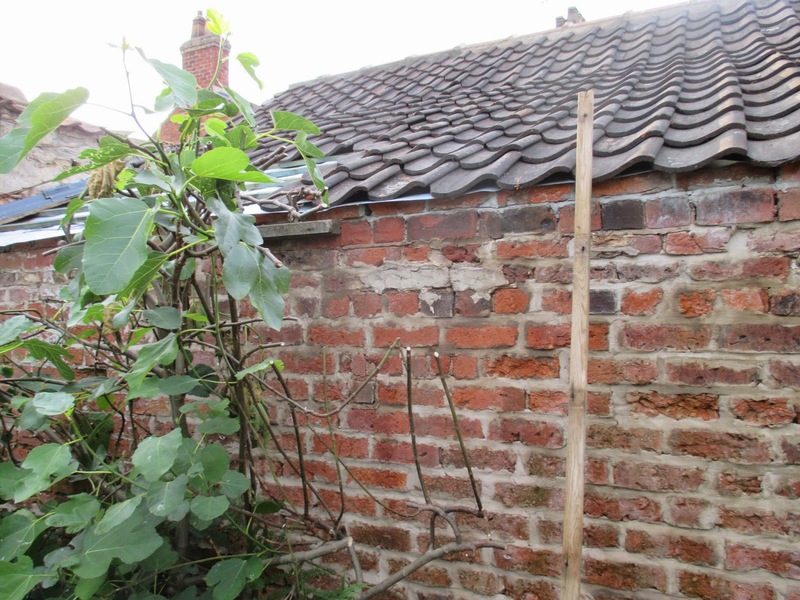 How lovely to have a brick garden shed with a pantile roof. Fig trees seem not to mind about being abused - but it will probably take a while for it to get over its cruel but necessary pruning. Shame about the clematis though, cut down in its prime. One of my clematis grown on the garden fence is suffering from mildew, caused I think, from the neighbours privet overhanging and shading it. It will be an onerous task to get the ladders out and trim the hedge back - there's always something isn't there. 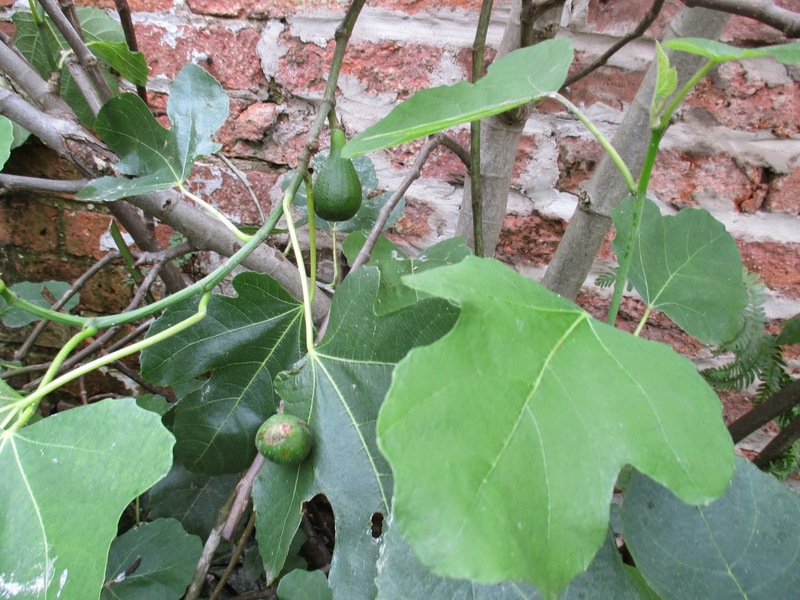 Hi Elaine, we are having such a great season - wet and warm - that growth is prolific, so I am hoping the poor old fig has a kick start back into growth! But it still has some figs despite its rough treatment. Awful having to cut back Polish Spirit just as it is looking good. But think how it will all look next year with the smart new roof. Hi Chloris, we still have figs ! Despite it all , we still have figs ! It's always a wrench to cut down something growing so well but I'm sure it will recover. It may even make it panic fruit! Hi Sue, I love the thought of 'panic fruit' - is it like the 'panic cleaning' I do minutes before guests arrive ? What a beautiful shed! Figs are tough cookies. My money is on a full recovery, coupled with a massive growth spurt and as the fig motors over your lovely new roof, you will be wondering why you worried. I like Sue's "panic fruit" - great phrase! Poor you having to cut back the flowering clematis. Here's hoping you get twice as many flowers next year. Hi sarah, I love 'panic fruit' too! I was idly reading a battered copy of 'gardener's World' from January 2013, as you do, and it happened to say how resilient fig trees are, and they can withstand most traumas ! I hope my gig tree has read the article too ! I have a feeling your fig tree will live to fight another battle. It sounds as if it's used to abuse, so maybe it won't even notice! Hi Sarah, it takes all the abuse I can throw at it without even flinching ! Oh no... I see a few progress on your fig tree. I'm so sorry about your fig. But I can see some fruits on the tree, I think this fig will recover soon. And I can see the fruits are ripen. I think you may be right Endah, it seems to be a tough old tree! Nature is wonderful, it just gets on with the job of regrowing, I'm sure your fig tree will be back to normal next year. Such a shame that you had to cut them both back at this time of year, at least you still have some figs to enjoy! Hi Pauline, it was so difficult to choose the right time of year to do the roof! From the roofer's point of view summer is better, but nor for the fig ! Sorry about your fig tree Jane! I thought I lost my Parthenocissus when the worker made a trellis for this plant, but it recovered. So I hope your fig tree will be fine! Hi Nazezda, glad your plant recovered ! I suppose it is a risk w take whenever we have this sort of work done ! The table setting in your last blog would convince me to sit and rest a while! I'm incredibly sentimental about things passed down in families....your teapot....what wonderful history! The stories it could tell!! Just lovely. Having roofs done is a necessary evil. It seems that we spent several years picking up roofing nails and bits of shingles.....sorry to hear you had to cut back two such beautiful plants! Clematis is one of my favorites and the Fig is so interesting......very foreign to my neck of the woods.....I agree that we die hard gardeners spend a lot of time working....when I'm sitting in the garden I'm critically looking to see what needs to be done! Hi Flower Freak, that teapot could tell so many stories - it sat on a table in a Victorian Station master's house in Yorkshire and was there during the First World War when my 2 great uncles went off to fight . They both came back, although one of them lost a leg. I am sorry for your fig tree, Jane. I dread workers, every time any of them come for any job, something ends up dead or broken in the garden. At least you had to prune your tree for a reason, but most of the time damage happens because construction people are not aware that there are these living green things called plants. One time, one of them dragged something heavy across the lawn leaving an ugly rut, I ran up to him and asked to please stop ruining my grass. He said, "What grass?" Hi Masha, I hope your lawn made a full recovery ! I know exactly what you mean, I have seen plants just trampled underfoot as a job was being completed. Heart breaking! I suspect you are right ! Nothing seems to kill this tree !It clearly has superpowers! Oh no! Jane, your poor fig... Good job they are such tough plants. And hey, at least now it can be left in peace to monopolize the wall. Plus, no leaky outbuildings. Hi Janet, I don't think I had appreciated quite how tough fig trees are ! I started off thinking they were delicate little things which needed nurturing! Maybe I'm a hopeless optimist, but I think the fig tree will survive. In my experience (different climate to yours) they're tough as old boots. 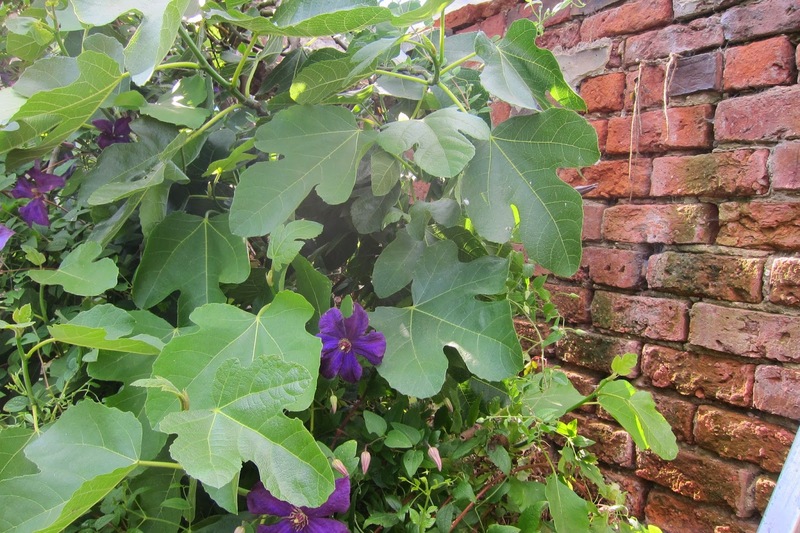 Hi Sue, I think that the fig tree is a hopeless optimist too! 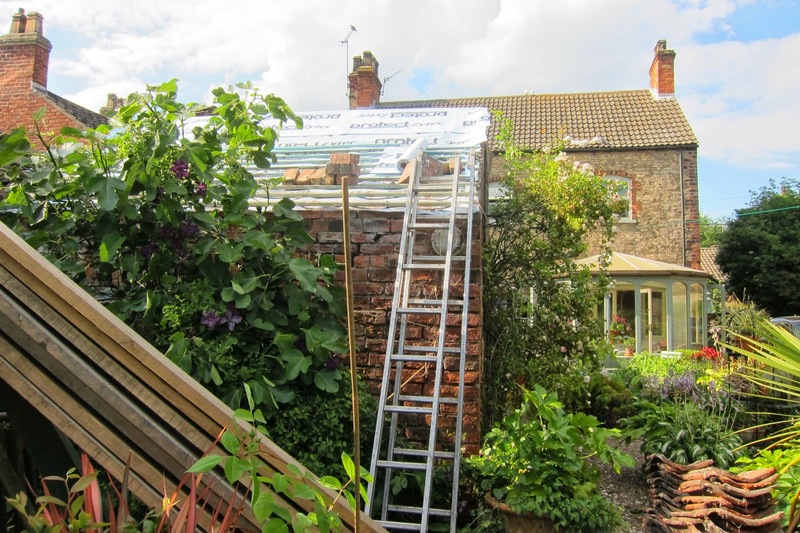 What a lovely new roof and I think the fig tree will forgive you and grow back beautifully! Hi Donna, we are pleased with the roof, as it is so nice not to have leaks after so many years ! I agree that the poor old fig tree will live to fight another day ! It's always sad when plants have to be cut back in their prime. I can see some nice looking fruits on your fig though, so fingers crossed it will survive and flourish. Plus, you have a gorgeous looking, watertight shed now! Glad to have found your blog by the way :-) . Hi Paula, good to see you here ! You are right, there are lots of figs left on the tree, and I get a shed which doesn't leak like a sieve anymore ! Win win maybe ? That poor tree. I adore figs. Amazing fruit and I love the big leaves. I understand the need to get the roof done though. 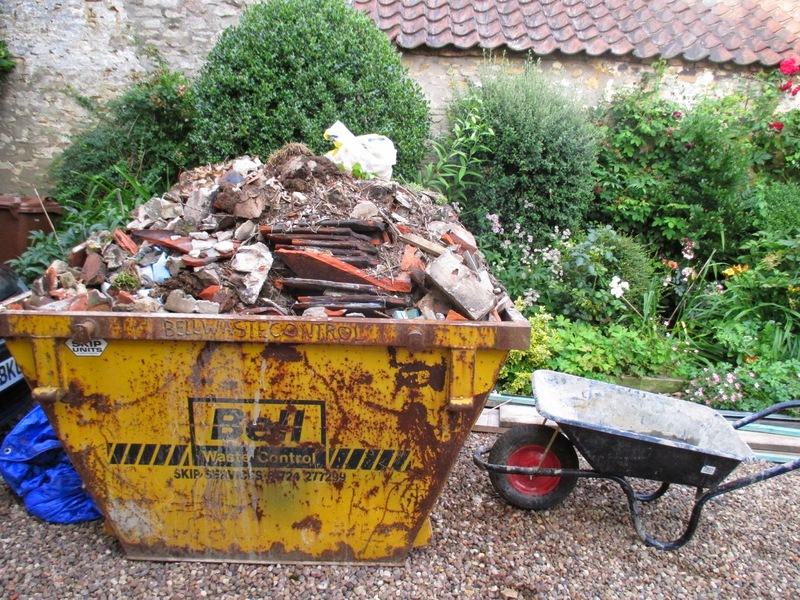 When we bought our house I resolved not to do any gardening anywhere around it until the roof had been dealt with because I just knew there would be a heck of a mess when that got done. New roof is absolutely essential though. Check this interesting article!It's helps you choose the best roofing company in FLorida! Looks nice fig tree! You should take care of your roof regularly to fix any small or big damages. Blaine Roofing will always wit you. Thanks and love your fig tree.